This project has been a long time coming. The facility was constructed with EPA funding and tribal match funds, as well as other partners. The Tribe did not have the capacity to send staff to produce the fuel so the Boys Club has stepped up to provide the staff. 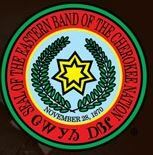 The Cherokee Boys Club is a non-profit corporation and currently provides transportation services for the Cherokee Central School system. All of the Club’s school buses and many other tribal vehicles are powered by the biodiesel fuel that the Club produces providing a cost savings on the fuel and ensuring continuing employment opportunities for tribal and community members. Biodiesel fuel is a clean-burning alternative fuel produced from renewable resources such as plant oils, animal fats, and used cooking oil. The Club can produce up to 250 gallons of biodiesel fuel per day, but we need your help to provide the waste oil to do this. Because of the Club’s non-profit status, your donation of used cooking oil will be receipted for tax-deductible donation purposes. In keeping with the culture of our native people, this opportunity helps us to contribute to the sustainability of our earth and our natural resources. Please help us to be good stewards and to be a part of a bigger effort to implement programs to renew and recycle waste products into usable products.